We were invited to a party on Saturday night. What to bring to a party can greatly depend on the type of party it is and how many people are going to be there. This particular party, as we were told, is one of the craziest parties that kick off the summer; clearly THE party to attend and we weren't about to miss it. Food was not the appropriate item to bring along; this party called for alcohol- but do we bring a six pack of beer or a bottle of wine or.....jello shots? Jello shots definitely carries the most fun factor while still offering the opportunity to be creative. I saw this recipe in Food and Wine some time ago and they sounded so fabulous. I think what is really exciting is the other ideas that this recipe is sparking: I'm already thinking limoncello jello shots, grappa jello shots maybe even a rum and coke jello shot! These were a huge huge hit at the party, we could have made hundreds more! We left the party about 3 am and people were still talking about them Mitch thought they were extremely potent, or so that's what I think he was saying as he held up the wall next me. Dave thought they needed more rum. Just know your crowd and plan accordingly. warm this over medium-high heat until the sugar is dissolved. 3 envelopes of unflavored gelatin, whisk until this is dissolved. Pour the hot sugar water into the lime juice and let steep for 15 minutes. Add 1 cup of white rum. Strain, then pour the mixture in to your jello shot cups (add a mint leave here for better presentation and for a slightly mintier flavor.) I couldn't decide if each shot should have a mint leaf in them or not. My concern was that it might hinder the shot to just slide down- but the extra minty flavor was nice in the shot that I did put leaves in. **Updated note: DO strain the mint leaves out. When I put the extra leaves in, it was a fresh leaf after the shot were already set. If you want to add one or two fresh leaves to the top for presentation- do it just before serving and then take them out before eating. If you don't strain the leaves- you'll end up with a weird chewy shot that doesn't slide down (I heard our friend Kasey's shots didn't turn out so well because of this!). I highly recommend m aking these for your next party. They are quite simple and you'll be the hit of the party! Watch everyone flock to you to find out how you made them; and you can just smile, thro w down a shot and be fat and happy! hi monique, could I check on your recipe...when you say 3 envelopes, does it mean "sheets" of gelatin? the shots look great! i can't wait to try your recipe for my next party. thanks for sharing. The plain gelatin I have is in envelopes- which equates to 1 tablespoon of gelatin. As I understand it, 4 sheets of gelatin equals one envelope (which equals a Tbls). You're going to have fun with these as they will make you a super star at any party!! Let me know how these work out for you! Did you see the posting for the Pomgranate Basil jello shots? You used 3 envelopes, equally 3 tbsp worth? Therefore, if I use leaf-gelatin, I will use 12 leaves, since 4 leaves = 1 tbsp. I'm so excited to make these! 12 sheets would be correct, based on all the research! Give it a go and see what happens, worst thing might be that you have to remake them. 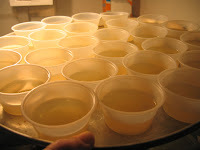 I was recently working on a limencello jello shot- between not enough gelatin and too much alcohol they didn't totally set up. They were more like Jello-sliders. But, we ate them anyway and I'll try again! I bought all the ingredients and kind of chocked when it came time to mix in the gelatin. I am planning on making the exact measurements as you noted above, but I had bought a 3oz lime gelatin powder, how much am I supposed to add?? Hi there... I'm unfamiliar with the lime gelatin powder, so I can't say how that will taste with the fresh lime. My guess on the measurement would be 3 tablespoons, since I used 3 envelopes and each nearly 1TBLS. I'm posting a new photo of the envelopes I use; i'm wondering if you bought the basic Jello box of gelatin? Let me know if how that works! 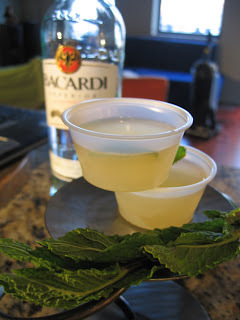 i'm so embarassed that i'm catching onto the mojito jello shot craze so late (i see you posted this recipe a year ago!!) but i made some last night for a party this afternoon and they turned out grand!! 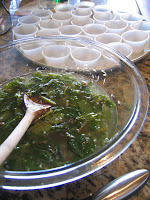 i also figured out, if you like, the recipe can easily be modified for mint julep jello shots!!! i realised this after i got home and figured out i was almost out of rum, but i had bourbon in spades (as any good kentuckian should!!). the logistics are the same, just omitting the lime and subbing bourbon for the rum. so now i have a variety tray!! thanks again for a great recipe!! it's going in the box for good! Lucky Cowboy- the Jello Shot craze continues, so need to worry! And I completely love that you turned them into a mint julep shot. Great idea, I'll need to try it out for the next big derby day. Trial and error is what Fat and Happy is all about!! I did a Basil-Mint Limeade the other day that looked totally like sludge water, but tasted wonderful. So I used colored cups to try to draw less attention to the color. Keep experimenting and let me know how it goes!! Do you think these would work if I poured the mixture into a pan, to slice like jello jigglers? would I have to reduce the water a little to make sure they set up? Lucy's Lara- I do think it will work in a pan, it just may take a bet longer to set up. I would probably not make them too thick. Let me know how that works out.